You know those Instagram-perfect desk pictures. The ones with the iPad, almond-milk cloudy coffee in a gorgeous ceramic mug – possibly Denby or Anthropologie, a fountain pen, a Leuchtturm notebook with fancy calligraphy and Washi tape. Probably something seasonal too like some pine cones, cherry blossom, sunflower seeds, a novelty bauble, whatever. Artistically arranged on a tabletop of rustic wood or marble. Photographed from above with a mobile phone with excellent pixel potential or fancy DSLR camera. Well. Here’s some honesty heading at you. Taken with my mobile phone with nothing cropped or photoshopped (although I use GIMP). I’ve just scaled it from around 4,000 pixels to 800 by 600 so it will upload. I cannot even claim that this is ‘organised chaos’. 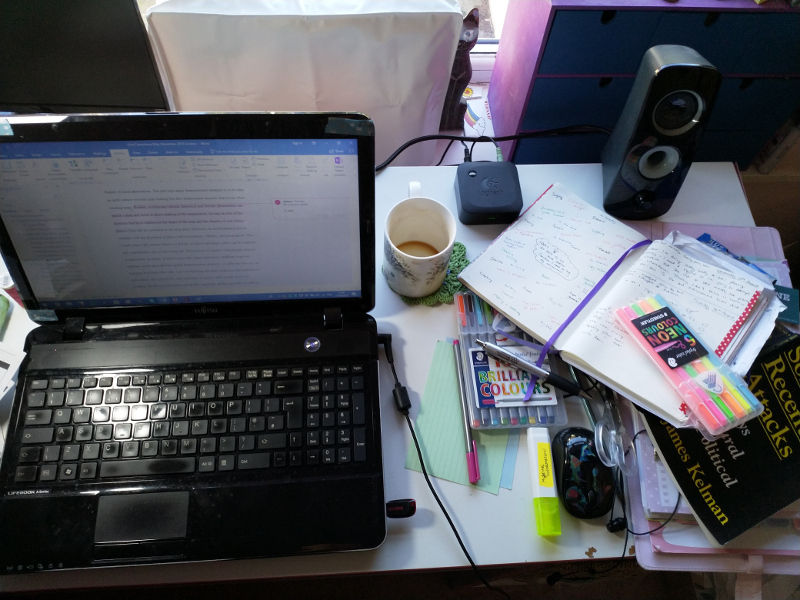 What you can’t see on the other side of my ancient, heat-guffing laptop is: a lamp, the other speaker, a used cotton “man-sized” handkerchief, a pile of dog-eared PhD thesis notes, a spool of Gütermann thread (colour = 890), and a tennis-ball sized stress ball in the shape of the earth. Honesty, dude, it’s the way forward. As I’m getting older I care less what others think. I care more about being kind and honest. This entry was posted in Jennie B, Writing and tagged #40daysto40 by jenbee. Bookmark the permalink.